What would it be like to see the sky around the world at the same moment in time? While it is not possible to experience this directly, live webcams stationed across the globe do permit a form of simultaneous sight. 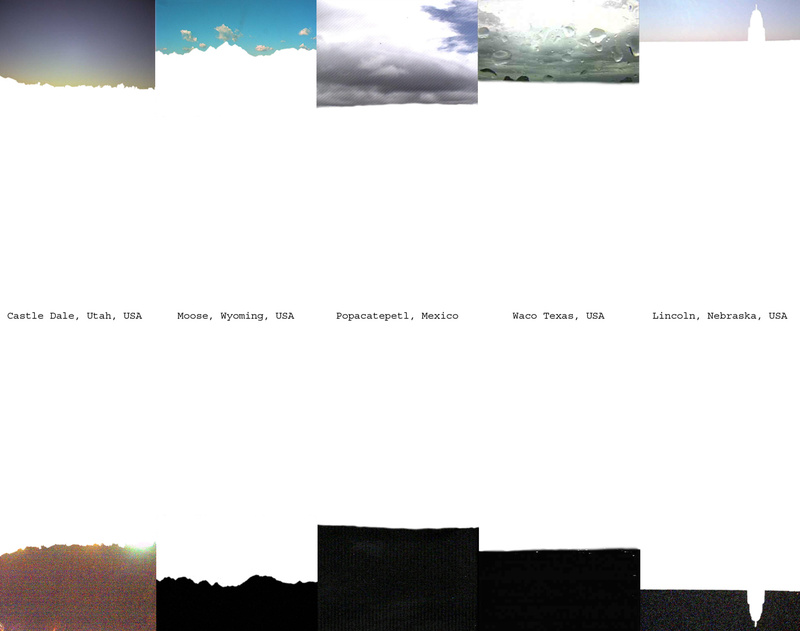 To capture and synthesize this information, I utilized 52 webcams around the world that include the sky and took screenshot images of them at noon and midnight (Eastern Standard Time), on October 4, 2004. All but the sky is removed from each image and they are arranged in order of their longitudinal location, starting with Columbus, Ohio (82° 59′ W), proceeding eastward to Orlando, Florida (81° 22′ W), to Ottawa, Canada (75° 43′ W), etc., until ending at Cincinnati, Ohio (84° 30′ W). The sky images are printed out as a ten-foot long panorama, with those taken at noon placed at the top and those taken at midnight inverted and placed at the bottom.